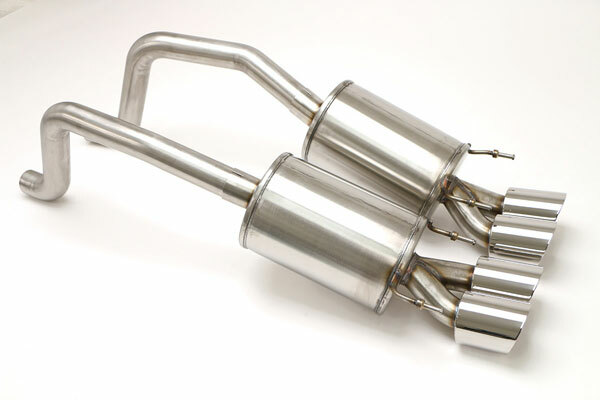 B&B Billy Boat Exhaust FCOR-0525 - B&B Corvette C6 PRT System Quad Round 4 Tips; 2009-2013. The Billy Boat Performance Exhaust PRT C6 exhaust system is the latest in resonance control technology from B&B, Completely redesigned and reengineered for the C6, the system is simple in design, though more complex in theory. You can now have a mellow sound at cruising speeds and a sport note under throttle. It allows true straight through exhaust passage under aggressive driving, though a mellow sound is emitted at cruising speed thanks to the unique Purge Chamber. Designed especially for the automatic, paddle shift, and cars with headers. The Billy Boat Exhaust PRT C6 exhaust system is the latest in resonance control technology from BBE. Completely redesigned and reengineered for the C6, the system is simple in design, though more complex in theory. You can now have a mellow, no-drone sound at cruising speeds and a crisp, clean, noticeable sport note when you’re tearing up the streets. The PRT comes complete with a true straight-through exhaust passage under aggressive driving conditions, though a mellow sound is emitted at cruising speeds thanks to the unique Purge Chamber. The fact that the PRT C6 exhausts do NOT have that unpleasant DRONE was the most popular aspect of our Purge Resonance Technology. This was usually shared with an appreciation of how you (or whoever’s driving, really) have so much control over your C6 exhaust system, both in sound and in the correlating performance and driving experience.